For general performance testing, we will be taking a look at a several benchmarks that will test the ASUS Maximus VIII Extreme focusing on several key components, mainly memory and CPU utilization. 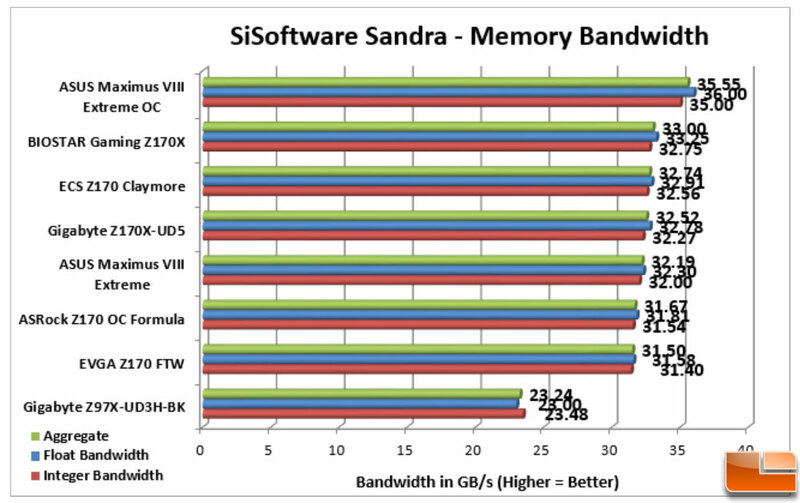 Several will also take into account the GPU, however it is generally not a key factor in the results. The ASUS Maximus VIII Extreme configured the Kingston Fury DDR4 kit without any issues, utilizing the XMP settings, even though this particular kit is not configured for the Z170 chipset. The XMP settings, set the memory to run at 2666MHz with 15-17-17-35-2T timings. The Kingston Fury kit received average scores within the Memory Benchmark, coming in about the middle of the Z170 motherboards. What was surprising was that we were able to overclock the Kingston Fury kit to new heights with the ASUS Maximus VII Extreme motherboard. From the previous maximum overclock of 3000MHz to 3100MHz. This of course increased the memory bandwidth to new highs. 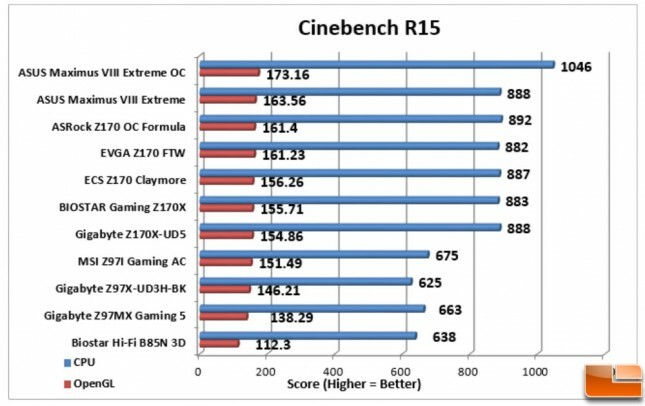 Cinebench is one of the benchmarks that takes the GPU into consideration for it’s scores. Here the ASUS Maximus VIII Extreme received top marks for the OpenGL part of the test, and near top marks for the CPU test. Of course, as you might expect, overclocking the CPU greatly increased the CPU score. 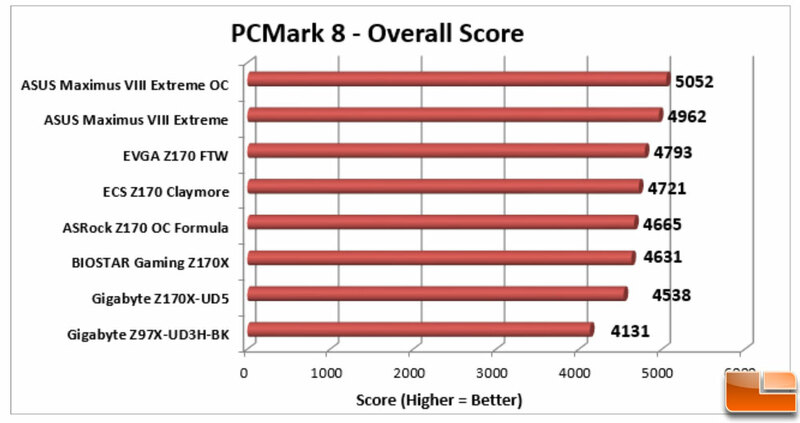 PCMark 8’s Home Advanced benchmark is a good benchmark for a typical home user workload. 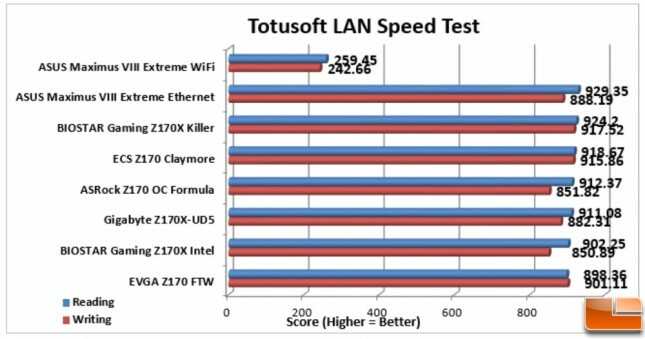 In this test, we received a 3.5% increase in scores at base clock speed over the other Z170 motherboards. 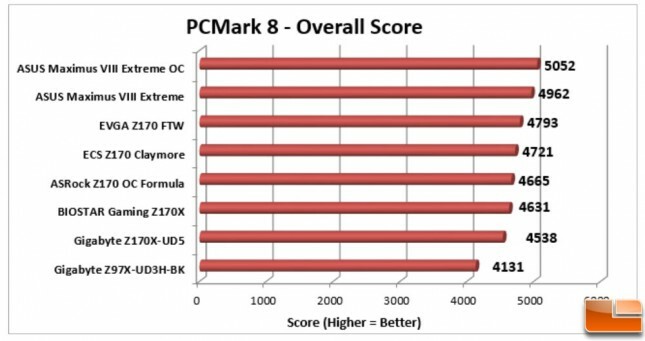 However, at overclocked speeds, we only got a 1.8% boost in performance within PCMark 8. 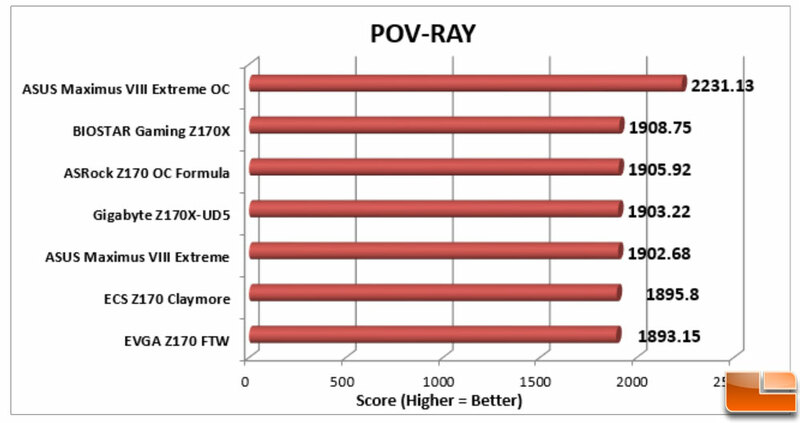 With a difference of 0.3% in scores, the ASUS Maximus VIII Extreme performed rather well within POV-RAY, which focus’s on the CPU performance. Once overclocked, the score increased to 2231.13, a 17.3% increase! 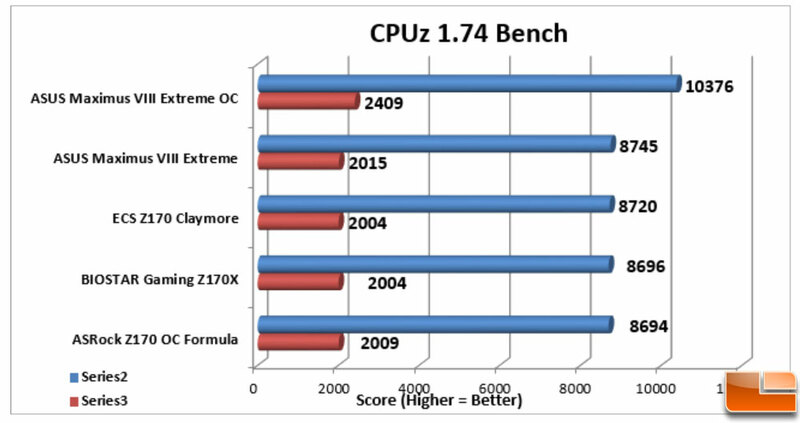 In version 1.74 of CPUz their new integrated benchmark gave the ASUS Maximus VIII Extreme high marks in both tests. Which increased once we overclocked the CPU. 18.65% boost in the Multi-Core test, and 19.55% in single core testing. The integrated Intel i219V ethernet connection performed about where we would expect it to. The Read speed was a bit surprising, and was run multiple times to validate it. Even though the network speed would fluctuate, it consistantly scored between 920MB/s and 931MB/s. The Write speed is about average for what we have seen with the Intel chipset. 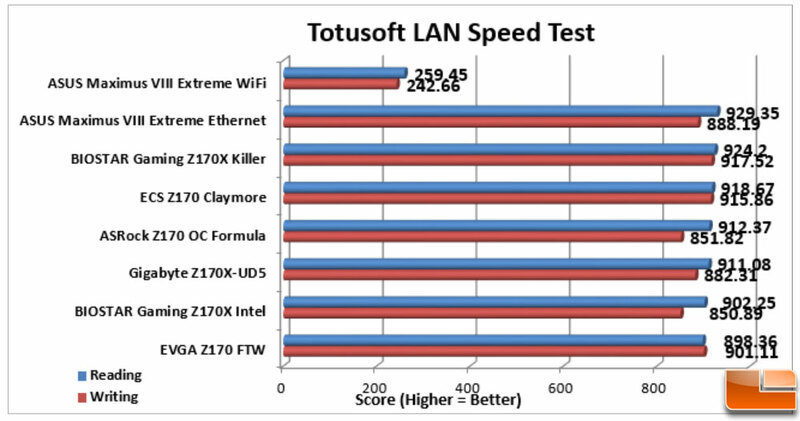 Since the ASUS Maximus VIII Extreme also includes a wireless option, provided by Broadcom, we tested that as well. The speeds of the wireless are not close to the ethernet connection, which is to be expected. Testing the wireless on a 5Ghz channel to a Netgear Nighthawk R7000 we received scores around 250MB/s for both Read and Write tests. Legit Bottom Line: For overall productivity performance, the ASUS Maximus VIII Extreme received average scores across the various benchmarking suites. Once overclocked, the ASUS Maximus VIII Extreme did exceptionally well, boosting performance on average 17% or more!